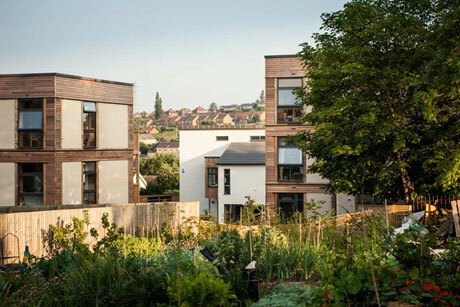 Lilac set up their 20 household scheme in the Bramley area of Leeds 2012 to provide permanently affordable homes in a community where “all residents feel they are part of a strong, flourishing neighbourhood where they can directly participate” through environmentally “low impact living”. Lilac were the first co-operative to use the Mutual Home Ownership (MHO) model first proposed by the New Economics Foundation and CDS Co-operatives. There are some detailed complexities to the MHO model, but it is basically a collective approach to home ownership. Its core principles are that MHO society members and residents pay a collective mortgage rather than traditional individual ones. MHO society members contribute financially on the basis of their income levels – defined in Lilac as 35% of net household income. MHO society members build equity that they can potentially take with them based on a national income based formula rather than property values, ensuring that homes remain affordable for subsequent MHO society members. The value of equity shares allocated to each household can differ between 90% and 110% of the cost the household’s home, providing a range of affordability and enabling Lilac to reduce personal financial risk in a challenging home ownership environment. Lilac’s homes and land are owned by the MHO society which is owned by the society’s members – the residents who live in the homes provided. The MHO society is legally a co operative which is democratically controlled by its members. Each member household has a lease which grants the right to occupy a specified house or flat owned by the MHO society. Lilac has a 25 year fixed rate mortgage provided by ethical bank Triodos at 3.5% above base rate which financed Lilac’s scheme costs (land, homes and common house development). Lilac is about co-operative self-management and establishing a stable community. 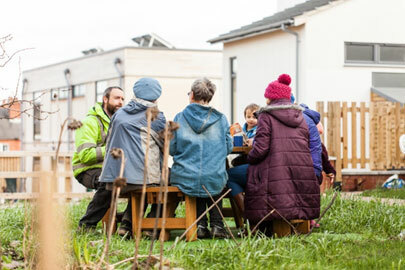 The community infrastructure – the common house and other shared facilities – green spaces, allotments, pond, a shared garden and a children’s play area – have been important for community interaction. The common house is at the heart of the community, and includes communal cooking and eating facilities, laundry facilities, meeting space, play area, office and guest rooms. Our members bought into Lilac as much for the value of our community as for the affordability of our homes. It’s a key part of our identity. For example, food plays an important role in Lilac. In the Common House we stock up regularly with food bought in bulk which reduces our food bills. We meet twice a week to eat together in the Common House: the time we spend relaxing over our meals creates space to talk and share and build the links that sustains our community.